Samsung today announced a new virtual reality experience aimed at kids, that allows them to explore a VR world at bedtime. Of course, what you probably want to be doing at bedtime is strapping a Gear VR headset onto your child, and thus placing a bright phone screen just inches away from their face. It’s not like the suggestion of ‘blue light’ (like that emitted from a phone screen) being bad for both health and sleep patterns hasn’t been discussed for years? Oh wait, yes it has. To be fair, it’s not like Samsung is just suggesting you slap a Gear VR headset on your child as a replacement for your regular story time, but rather as a way to share it remotely when you can’t be at home and to stay in touch. It’s not a bad intention, just a confusing execution, and it’ll be more surprising if it doesn’t eventually end up as a replacement for story time. Already this month, Samsung launched an app designed to get children to hold phones and tablets further away from their face, precisely because of the risk of damage to eyesight. 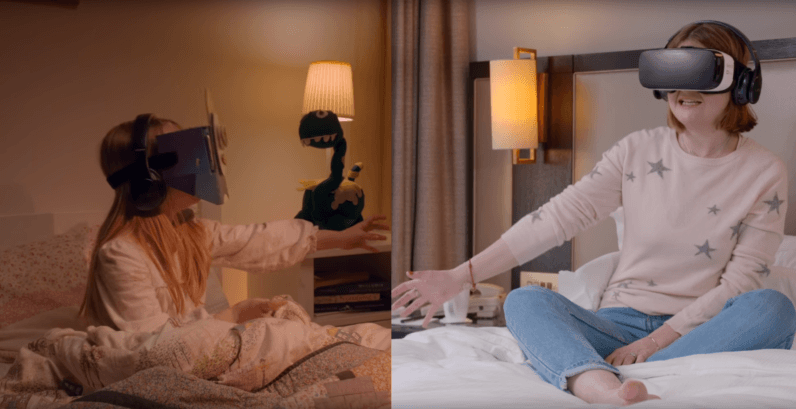 Samsung Bedtime VR Stories seems to be presenting the opposite idea. Which is it to be, Samsung? Don’t hold them too close, or strap a phone to your child’s head at bedtime?